(Dubai, UAE – January 31, 2019) This Valentine’s Day, Rado is taking a thoroughly modern approach to romance, with two design-led, technical timepieces that will suit people with style and that are guaranteed to stand the test of time. Is the one you love always late? Give the gift of accuracy – and a subtle hint you won’t wait forever. Are you planning to marry in 2019? Make sure you make it to the altar on time. Or maybe you’re single and focusing on the most important relationship of all – the one you have with yourself. Whatever your motivation, there’s more to the DiaMaster Petite Seconde COSC than an innovative movement with up to 80 hours of power reserve. 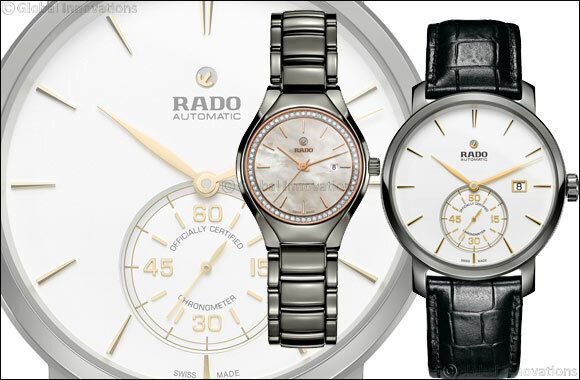 The design-led DiaMaster collection is a minimalist masterpiece – no surprise given that Rado is the most forward thinking design player in the watch industry as well as an award-winning designer in its own right. For those looking for an eye-catching statement that is all about shine, the True Automatic Diamonds is made for Valentine’s Day. With a quality Swiss automatic movement inside and 60 shimmering diamonds on the outside of the mother-of-pearl dial, it’s sure to capture the heart of watch enthusiasts of all ages. Rose gold coloured accents add warmth to a super cool watch made in full high-tech ceramic.